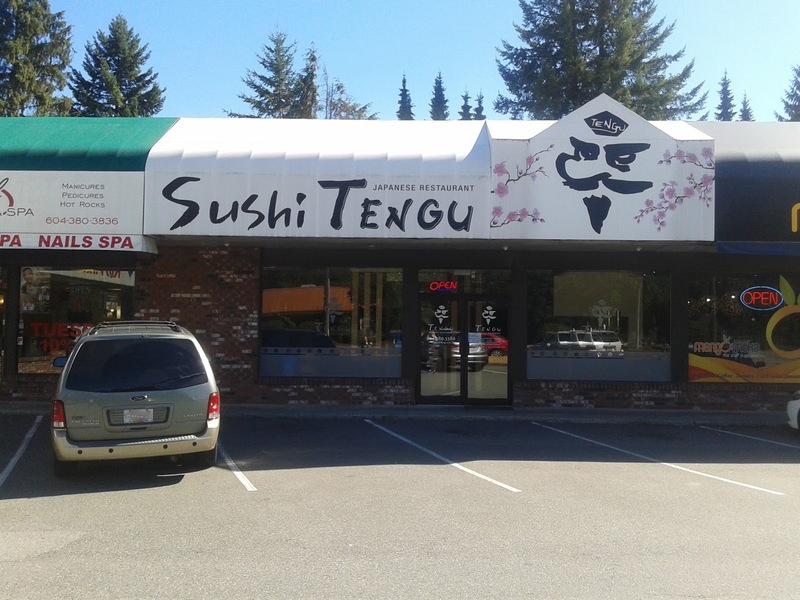 While browsing through the various menus of sushi restaurants in Maple Ridge, I came across Sushi Tengu's eclectic mix of special rolls. One that particularly caught my attention was the 4 in 1 Roll, which featured half orders of four of their special rolls. When I saw that roll on the menu, I had two thoughts. 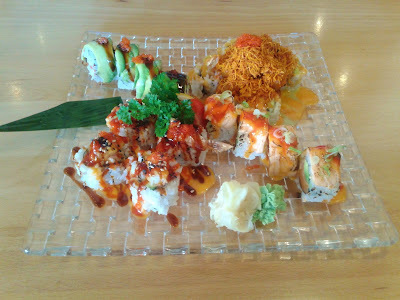 First, I would get to blog about four special rolls instead of just one. Second, the 4 in 1 Roll would almost certainly make a good photo for my blog. With that in mind, I enlisted the help of my dad so that my sushi adventure would consist of more than just the one dish. Our car indicated an outdoor temperature of 36 degrees, so I was itching to get indoors, while my dad claimed that he felt very comfortable in the heat and wanted to enjoy it in full blast. After the two of us were both nicely cooked, my dad said that he no longer needed to eat Chicken Teriyaki, which was a bit of a relief to me. Inside was a very clean and comfortable dining area with appealing modern decor. The jazz music in the background and the friendly service from the Korean staff complimented the classy vibe of the restaurant. It would be nice if a few more of the tables were occupied, but since we came at four in the afternoon, I wasn't expecting much in this respect. The Miso Soup was served very hot and was made with a rich, dark miso paste. 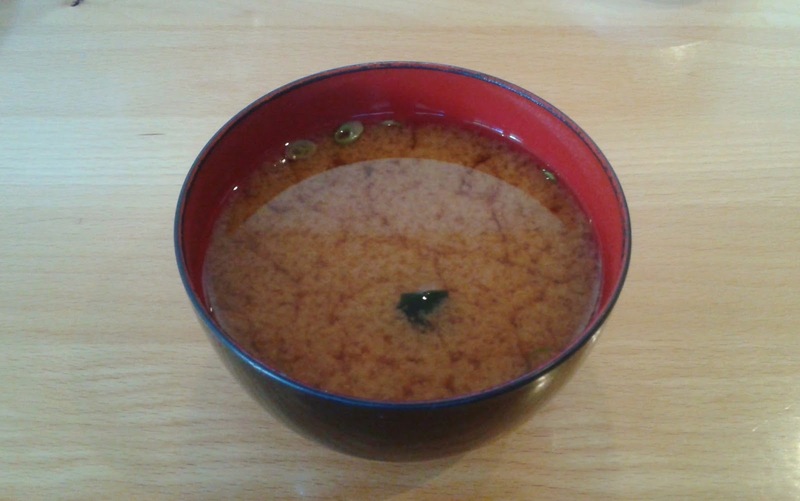 My dad consumed the entire bowl of Miso Soup because I couldn't tolerate any more heat. He told me to give it my average score for Miso Soup, saying that it was decent and that he wished for a bit more of the seaweed and tofu inside. The Salmon & Tuna Sashimi were beautifully arranged on a large plate so that the pieces looked smaller than they really were. In reality, the cuts were generous with the right thickness. 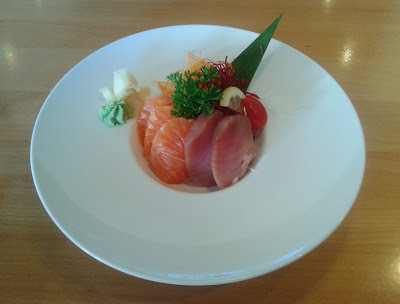 The Salmon Sashimi was the fresher of the two and had an appealing smooth and buttery texture. The Tuna Sashimi was a little less outstanding, but it was adequately soft. 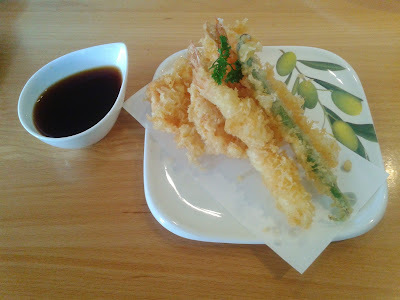 Overall, the Appetizer Tempura had a good amount of crispiness to it. The batter was a little thick and uneven on the two prawns, but it was better elsewhere. The prawns had a nice snap and a good burst of flavour. The green bean was quite juicy, while the sweet potato and kabocha both had enough moisture. 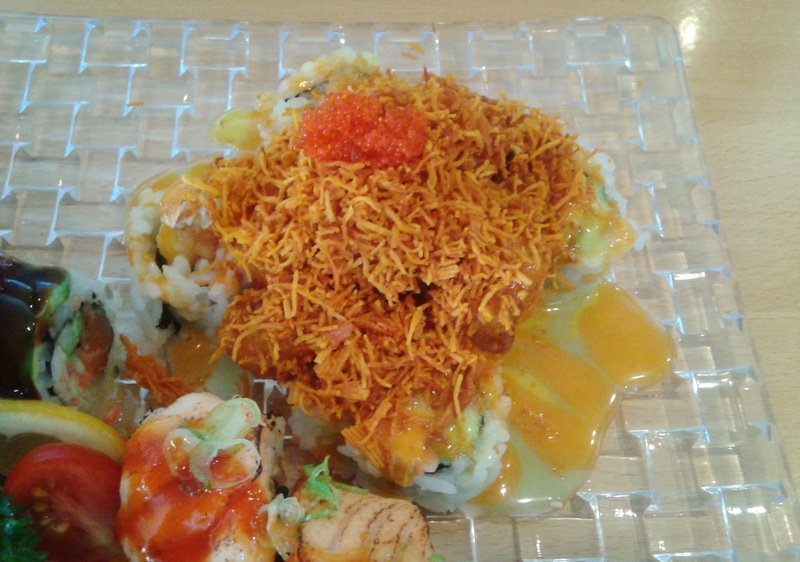 The TNT Roll was comprised of Califoria Roll topped with prawn tempura, tobiko, and a special sauce. The crab meat inside the TNT Roll was soft and sweet, while the prawn tempura was tasty and accentuated by the spicy chili sauce drizzled on top. The Salmon Tataki Roll consisted of salmon (in sashimi form inside the roll), cucumber, avocado, salmon tataki, and green onion. 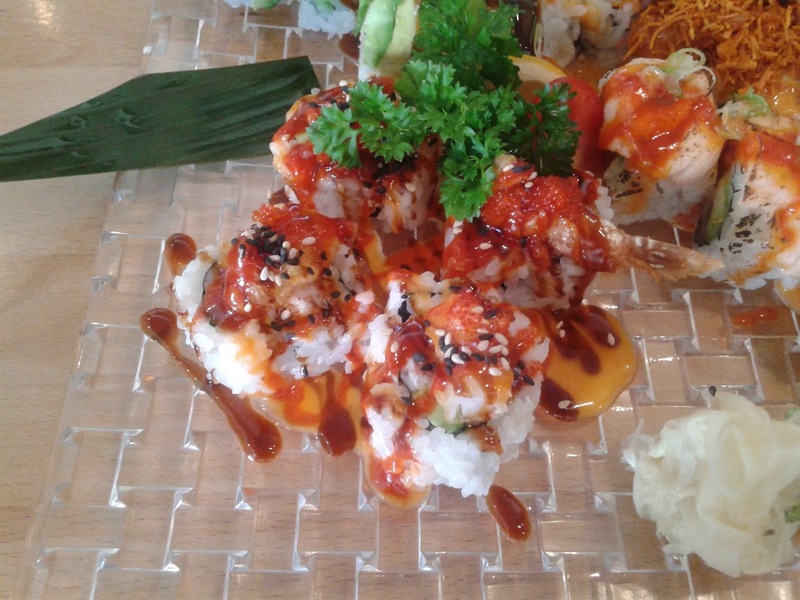 There wasn't much of a seared taste as the spicy sauce took center stage, but overall, the roll had a decent, soft texture. Perhaps the most creative of the four special rolls was the Popcorn Roll, which came with a California Roll base, prawn tempura, deep-fried scallops, yam bits, and tobiko. The fried scallops had a decent amount of moisture, and the yam fries added some crunch to the roll. 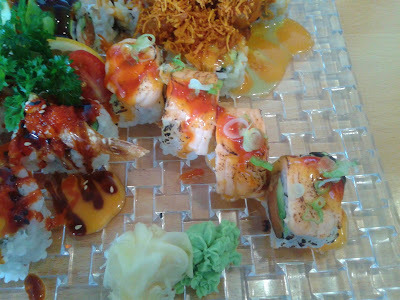 I also enjoyed how there was a dash of mustard among the sauces, which gave the roll a unique taste. 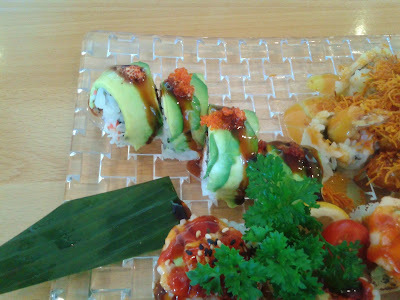 Finally, the Caterpillar Roll consisted of cucumber, unagi, crab meat, avocado, and tobiko. Being the great help that he was, this was the only roll that my dad was willing to try, and he only ate one piece of it. The unagi had a prominent sweet flavour, and one of the pieces was stuffed with a random piece of salmon sashimi (this worked fine for me). Ideally, this roll should be eaten first as it is the mildest in flavour. 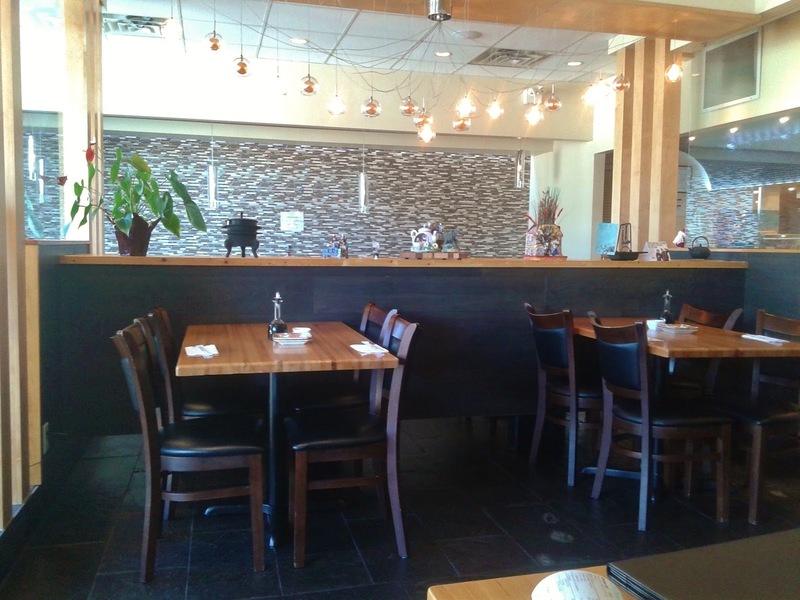 The service was quite attentive, and we found that the food was prepared with care. When the waitress caught sight of me trying to copy down all the components of the 4 in 1 Roll, she promptly offered me a takeout menu. Both my dad and I got the feeling that the restaurant was trying its best in every aspect. Along with Shinobi and Sushi Bar Iori, I dub Sushi Tengu one of the kings (or queens) of sushi in Maple Ridge. Uhh I'm literally drooling looking at all your pictures - especially the 4 in 1 roll! Looks SOO good. The 4 in 1 Roll was definitely one of the better special roll combos I've had. I ordered it for the sake of the photo, but it was executed better than I had expected! One month is quite a long time... I really hope you get your taste buds back soon. I want those ratings back!